On this day, we celebrate the life and accomplishments of one hayseed flour salesman from Ohio whose name went down in the history books: Mr. “Pappy” O’Daniel. “Pappy”, as pictured on the cover of “Beautiful Texas”. Wilbert Lee O’Daniel was born in Malta, Ohio on March 11, 1890. When he was a baby, the family relocated to Kansas following the death of the O’Daniel patriarch. Lee entered the flour industry at the age of eighteen, and soon went on the move, eventually settling in Fort Worth, where he began working for the Burrus Mill and Elevator Company of Saginaw, Texas as sales manager. 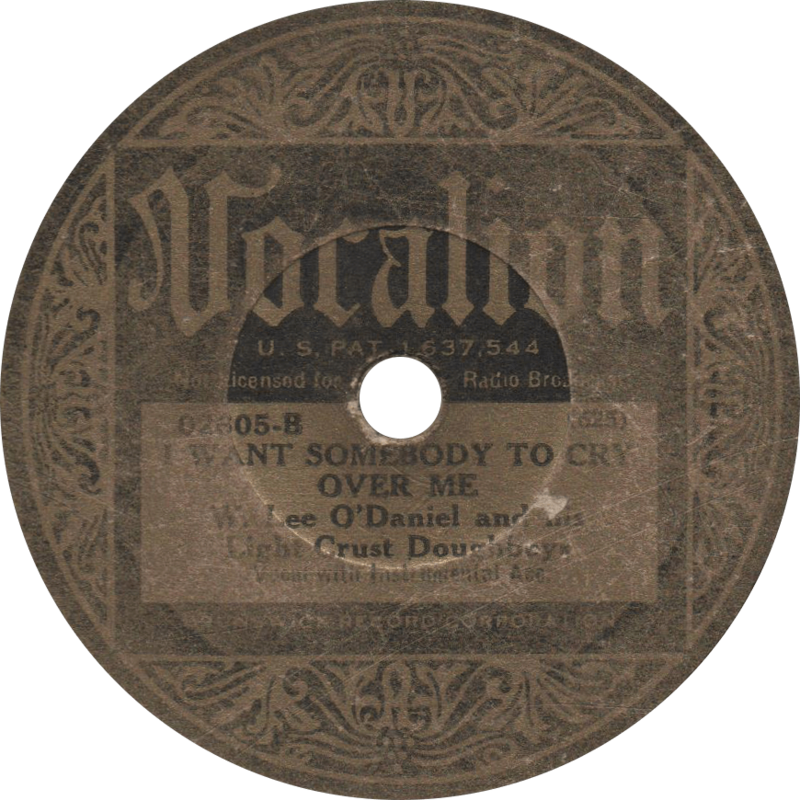 In 1928, O’Daniel became the company’s director of advertising in the newly emerging medium of radio broadcasting. About three years later, he hired the Wills Fiddle Band, at the time consisting of fiddler Bob Wills, guitarist Herman Arnspiger, and singer Milton Brown, to perform on the air as the Light Crust Doughboys. Not a fan of their hillbilly music however, O’Daniel canceled their show a couple weeks later. Fans of the show were not pleased, and soon the Light Crust Doughboys were back on the air. 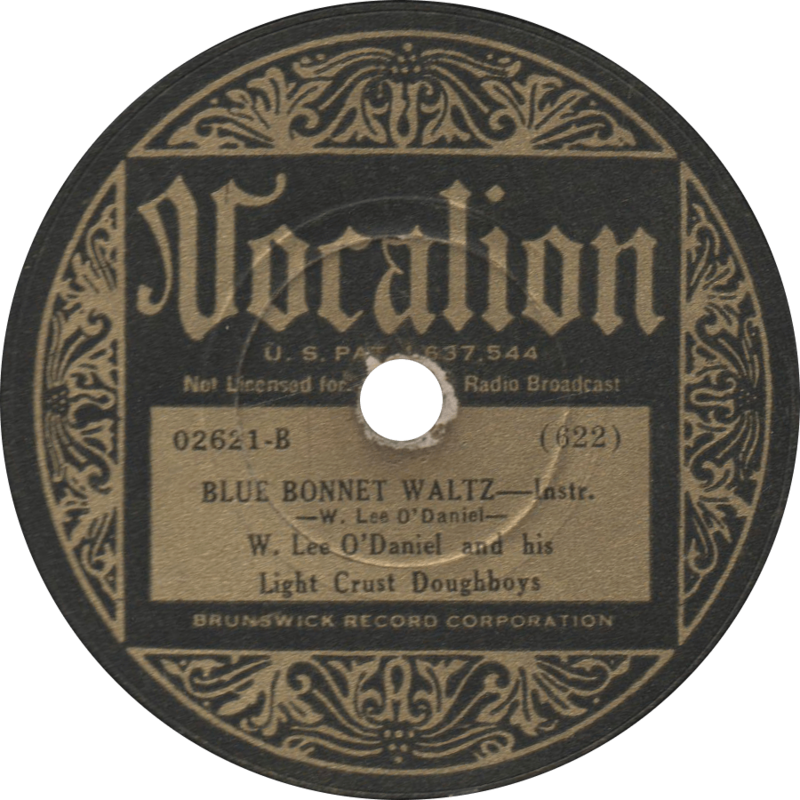 By 1933, the original Doughboys had parted ways, and a new lineup of musicians had taken over the moniker, going on to achieve great radio acclaim. In 1935, O’Daniel was fired from his position with the Burrus Mill, and he went on to found his own flour company, the W. Lee O’Daniel Flour Company, manufacturer of Hillbilly Flour. To promote the new product, “Pappy” O’Daniel formed a new radio band: the Hillbilly Boys, which included his two sons Mike and Pat. Broadcasting from WBAP in Fort Worth and “border blaster” XEPN in Piedras Negras, Mexico, the Hillbilly Boys also found considerable fame with their madcap radio theme “Please Pass the Biscuits, Pappy”. 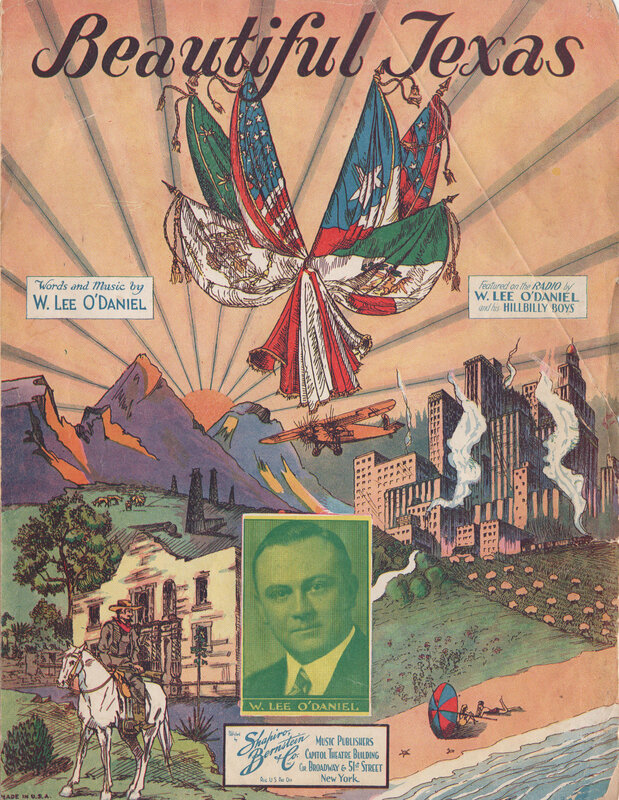 Come 1938, W. Lee O’Daniel registered to run for Governor of Texas—his platform, the ten commandments, and his campaign slogan, the golden rule. He took his Hillbilly Boys on the campaign trail and drew huge crowds. Winning the election, he promised no sales tax or poll tax, an end to capital punishment, and an old-age pension. He delivered on none. Nonetheless, he proved popular enough and was reelected in 1940. Shortly into his second term as Governor, O’Daniel set his sights on a more prestigious and powerful position, the United States Senate. 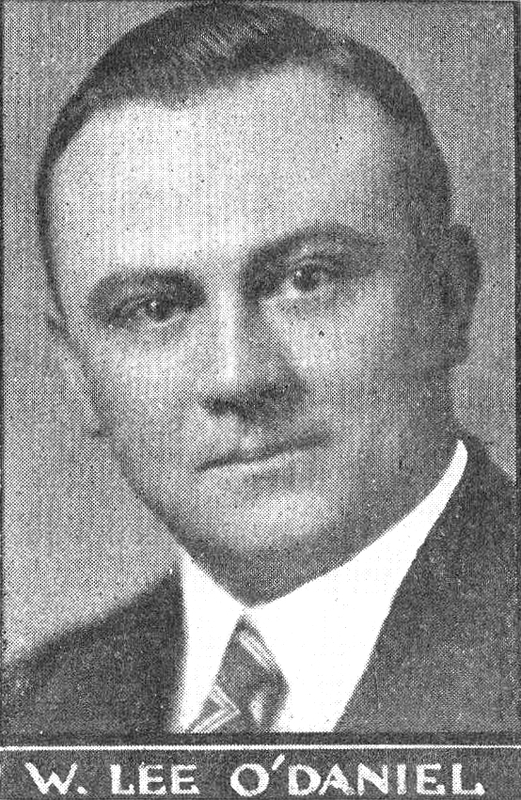 When Senator Morris Sheppard died in 1941, O’Daniel appointed the eighty-six year old son of Sam Houston, Andrew Jackson Houston, to fill his empty seat in the interim. When Houston himself died several months later, O’Daniel defeated Lyndon B. Johnson in a special election and took the seat for himself. When the next election came around, he asserted that his opponents, former governors Dan Moody and James V. Allred, were part of a communist conspiracy against him, alienating himself from some of his supporters, but nonetheless claiming the election. In 1944, he campaigned for the Texas Regulars, opposing Roosevelt’s fourth term. Serving ineffectively for eight years, O’Daniel declined to run for reelection in 1948—citing the hopelessness of saving America from the commies (though in reality he had simply embarrassed too many of his constituents)—and was replaced by “Landslide Lyndon”. Thereafter, he retired to a ranch outside Fort Worth, making several ill-fated political comebacks in the 1950s and claiming that the Supreme Court’s decision to desegregate schools in Brown v. Board of Education was a communist plot. 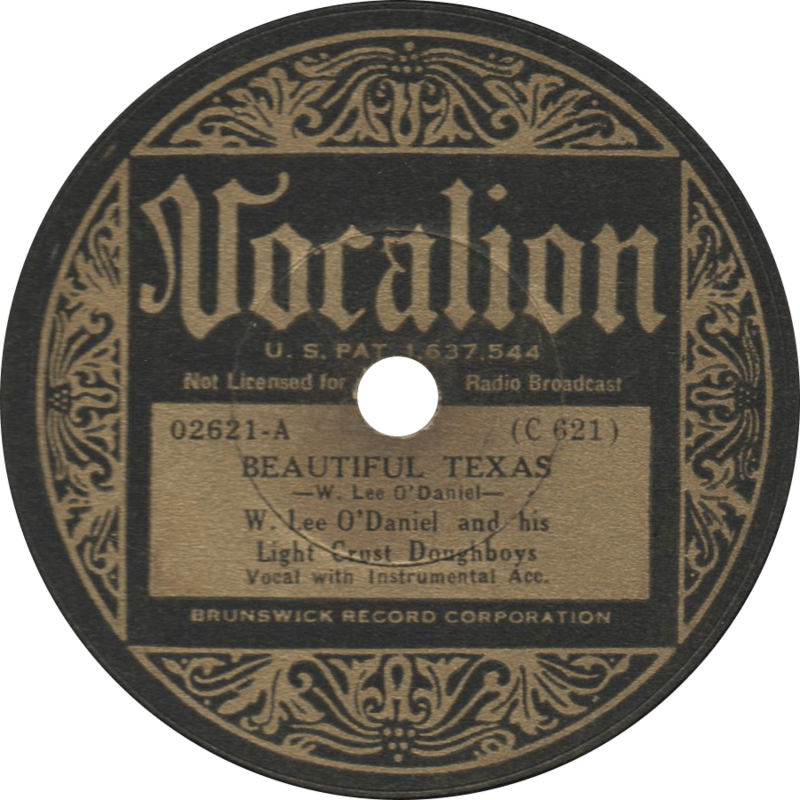 W. Lee O’Daniel died on May 12, 1969 in Dallas, at the age of 79. 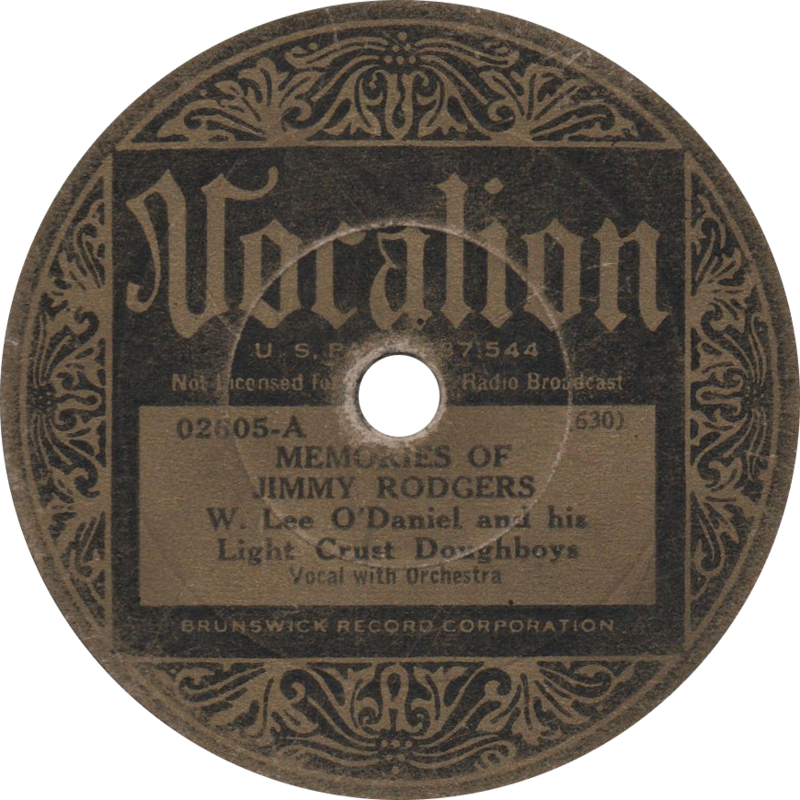 Vocalion 04727 was recorded in Dallas, Texas on December 3, 1938. The Hillbilly Boys are Mike O’Daniel on fiddle, Bundy Bratcher on the accordion, Kermit Whalen on the steel guitar, Pat O’Daniel on tenor banjo, Leon Huff and Curly Perrin on guitars, and Wallace Griffin on string bass. Huff sings the vocals on both sides. 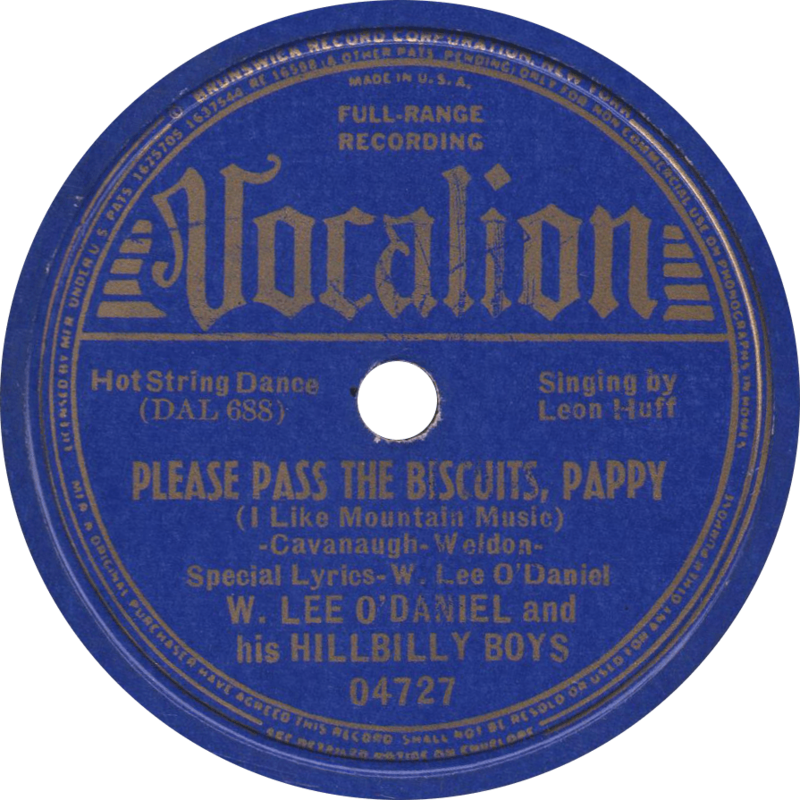 First: the Hillbilly Boys’ theme song, “Please Pass the Biscuits, Pappy”, really the 1933 song “I Like Mountain Music” with new words added by W. Lee O’Daniel to reflect his floury interests. Please Pass the Biscuits, Pappy (I Like Mountain Music), recorded December 3, 1938 by W. Lee O’Daniel and his Hillbilly Boys. On the other side, the Hillbilly boys do a swell job swinging the 1927 tune “One Sweet Letter From You”. I bought the record for “Please Pass the Biscuits Pappy”, but I do believe I like this one better. 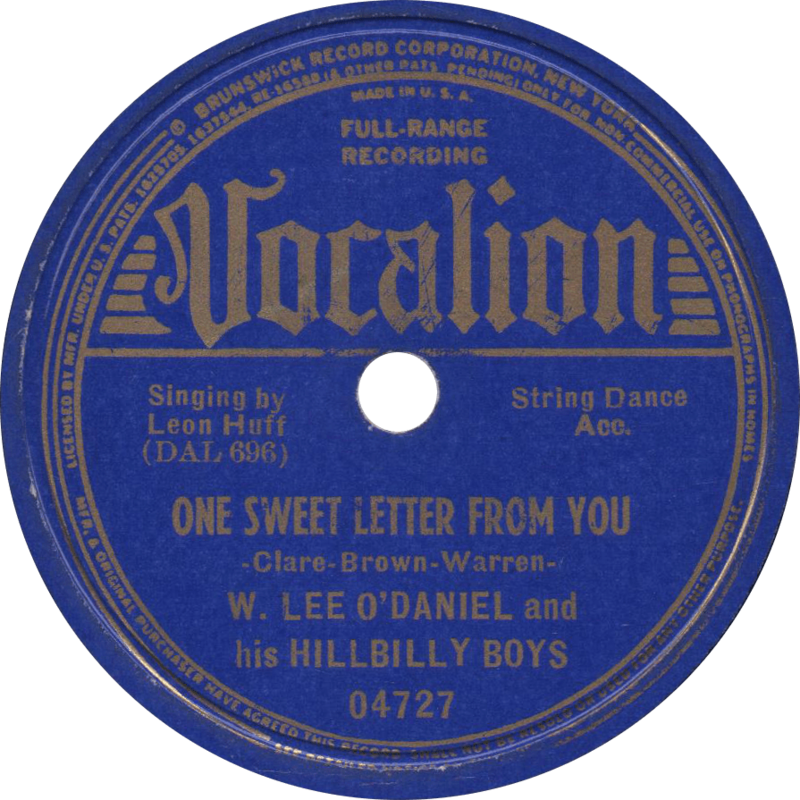 One Sweet Letter from You, recorded December 3, 1938 by W. Lee O’Daniel and his Hillbilly Boys. Listen all you rounders, you better leave my women alone. ‘Cause I’ll take my special and run all you rounders home.